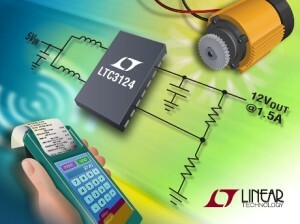 Linear Technology Corp have introduced the LTC3124 which is a two phase 3 MHz current-mode synchronous boost DC/DC converter featuring output disconnect and inrush current limiting. Dual phase operation has the benefit of reducing peak inductor and capacitor ripple currents allowing equivalent performance to be achieved in the power supply design with smaller valued inductors and capacitors. The LTC3124 incorporates low resistance MOSFETs with an RDS(ON) of 130mΩ (N-channel) and 200mΩ (P-channel) to deliver efficiencies as high as 95%. The output disconnect feature allows the output to be completely discharged at shutdown and reduces switch-on inrush. An input pin can be used to configure the LTC3124 for continuous frequency mode to give low-noise operation. Additional features include external synchronization, output overvoltage protection, and robust short-circuit protection. The LTC3124EDHC and LTC3124EFE are both available from stock in 16-lead 3mm x 5mm DFN and thermally enhanced TSSOP packages, respectively. 1,000-piece pricing starts at $3.26 each.